Andreas Althamer, a Lutheran divine, was born about 1500 in Brenz near Bundelfingen, Württemberg, Germany, and died 1539 as pastor in Ansbach. According to the Allgemeine deutsche Biographie the year of his death is uncertain: "According to one, he died about 1540, according to another he was still in Ansbach in 1544, and then went to the Silesian principality of the margrave of Brandenburg, where he died in Jägersdorf in 1564 as the leading pastor." 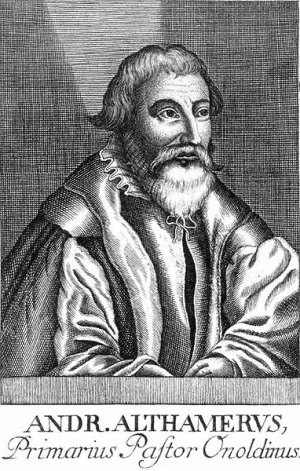 He was a zealous Lutheran and as such took part in the disputation of 1528 in Bern, Switzerland, and there defended the Lutheran doctrine of the Lord's Supper. While pastor in Eltersdorf near Erlangen he wrote a refutation of Hans Denck's booklet, Wer die Warhait warlich lieb hat, mag sich hierinn brüfen in erkandtnuss seines Glaubens auf das sich nyemandt in im selbs erhebe, sonder wisse, von wem man weisshait bitten und entphahen soll. In this booklet Denck collected 40 apparently contradictory passages of Scripture. Althamer's booklet bears the title: Dialloge hoc est, conciliatio locorum scripturae, qui prima facie inter se pugnare videntur (Nürnberg, 1527). According to Kolde, this is one of Althamer's most widely read writings, which later, greatly enlarged, was published in many editions and was at once translated into German at Althamer's request by his good friend, Sebastian Franck of Worth. Althamer was very likely the author of the anonymous booklet with the very similar title: Conciliationes scripturae, qui specie tenus inter se pugnare videntur, Centuriae duae (Nürnberg, 1534), with an original foreword and additions of his own. At that time Franck was still the Lutheran pastor in Gustenfelden (Middle Franconia) and an opponent of the Anabaptists. But by 1531 Franck had become the first historiographer of the Anabaptists in the Chronica, Zeitbuch oder Geschichtbibel and is considered their private friend. In the later edition of 1534 Althamer omitted the polemics against the Anabaptists, as Franck had already done. 1. Von der Erbsund das sye der Christen kynder gleich als wol verdamb als der heyden. Und von dem heyligen Tauff ob er die Erbsund hynweg nem (Nürnberg, 1527). 2. Ein kurtze Unterricht den Pfarrherrn und Predigern in meiner gnedigen Herrn der Markgrafen zu Brandenburg etc., Fürstenthumben und Landes hieniden in Francken und auf dem Gebirg verordnet, wes sie das Volk wider etliche verführische lere der widertauffer an den Feyertagen auff der Canntzel zum getreulichsten und besten aus göttlicher schrift vermanen und unterrichten sollen. A copy is to be found in the city library of Frankfurt, which was reprinted in Will's Beiträge. The former writing presented in detail the Lutheran doctrine of original sin, which was treated throughout in a responsible sense. If it was responsible, it was also damnable, and the necessity of baptism as the "bath of regeneration" followed. The entire content of the booklet followed this line of thought, with many Bible references. On the last pages the author presented a clever refutation—from his point of view—of arguments against infant baptism. The second booklet was printed, according to the foreword, upon the wish and direction of Margrave George of Brandenburg, who in his own name and that of his nephew, Margrave Albrecht, had it distributed to all the pastors and preachers in his domain, "for faithful use, in order that their parishioners be not misled by Anabaptist teaching." In this writing Althamer tried to prove the doctrine of infant baptism from the Old Testament. As circumcision was a sign of the divine covenant and grace, so also baptism was in the New Covenant. As the former was performed on children at eight days, so must baptism also be performed. Also from the command to baptize it followed that little children must be baptized; they were included in the term "all nations," etc. The conclusion of the booklet dealt directly with the community of goods of the Anabaptists, which was rejected as a devilish doctrine that stirred up rebellion. One other booklet of his must also be mentioned: Das unser Christus Jesus warer Gott sey, Zeugnüss der heyligen geschrifft, Wider die newen Juden und Arrianer unter christlichem Namen, welche die Gottheyt Christi verleugnen (Nürnberg, 1526). On 16 April 1531 Althamer, together with the local pastor Sigmund Schneeweiss and Joh. Rurer, cross-examined the Anabaptist prisoners Bernhard Weith (Weickmann) and Julius Lober in Ansbach. Althamer and Rurer in 1530 delivered an official opinion concerning the confession of Johann Hechtlein, who had become an Anabaptist for the second time. Hege, Christian and Christian Neff. Mennonitisches Lexikon, 4 vols. Frankfurt & Weierhof: Hege; Karlsruhe: Schneider, 1913-1967: v. I, 41-42. Herzog, J. J. and Albert Hauck, Realencyclopädie für Protestantische Theologie and Kirche, 24 vols. 3. ed. Leipzig: J. H. Hinrichs, 1896-1913., 3d ed. : v. I, 413. Kolde, Theodor von. Andreas Althamer: der Humanist und Reformator in Brandenburg-Ansbach. Erlangen, 1895. Schornbaum, Karl. Quellen zur Geschichte der Wiedertäufer II. Band, Markgraftum Brandenburg. (Bayern I. Abteilung). Leipzig: M. Heinsius Nachfolger, 1934: In the index of persons, p. 366 under "Hechtlein, Hans," and pp. 205-208. Teufel, E. "Der Täuferprozess des Pfarrers Joh. Hechtlein in Schalkhausen bei Ansbach 1529-30." Zeitschrift für bayerische Kirchengeschichte (1949, no. 2): 88-97. Will, Geoerg Andreas. "Althamers Unterricht. "Beiträge zur Geschichte des Antibaptismus in Frankenland. Nürnberg, 1773: 115. Will, Geoerg Andreas. Beiträge zur Fränkischen Kirchenhist. Nürnberg, 1770: 321-368. Neff, Christian. "Althamer, Andreas (ca. 1500-1539)." Global Anabaptist Mennonite Encyclopedia Online. 1955. Web. 20 Apr 2019. http://gameo.org/index.php?title=Althamer,_Andreas_(ca._1500-1539)&oldid=144701. Neff, Christian. (1955). Althamer, Andreas (ca. 1500-1539). Global Anabaptist Mennonite Encyclopedia Online. Retrieved 20 April 2019, from http://gameo.org/index.php?title=Althamer,_Andreas_(ca._1500-1539)&oldid=144701. Adapted by permission of Herald Press, Harrisonburg, Virginia, from Mennonite Encyclopedia, Vol. 1, pp. 79-80. All rights reserved.